These photographs are all of patients who have undergone the EarFold procedure for prominent ears with Jeremy Hurren. They have all given their written consent for their photographs to appear on Jeremy Hurren’s Website. It is important to appreciate that photographs of the results of cosmetic procedures and surgery should not be considered a ‘catalogue’ from which you can choose the appearance that you would like. 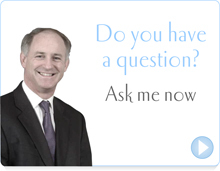 Many factors determine the appearance following surgery and most of these can not be changed. The main application of the EarFold clip is increase the folding of the antithetical fold. If your ears are prominent due to an enlarged conchal cartilage then EarFold will probably not be helpful and surgery may be the only option for repositioning your ears. However, photographs may be helpful in discussions with Mr Hurren about your expectations and what may or may not be possible for you. Please note: Mr Hurren will not give the details of the surgery these patients have had in response to email questions. An example of a prominent ear correction with an EarFold clip. 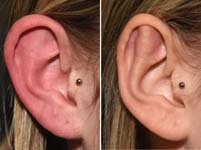 One clip has been place at the top end of the anti-helical fold of each ear. The before photograph is on the left and the after on the right. With EarFold there is a clip which is very similar to the EarFold clip called the PreFold clip. This can be put onto the outside of the ear to give an idea of the result of using an EarFold clip before undergoing the procedure. These pictures show the before on the far side, the PreFold clip simulation in the middle and the after picture on the right with the EarFold clip in position after the procedure. These pictures show the before on the left with an under folded antithetical fold. On the right is the after picture with the EarFold clip in position. 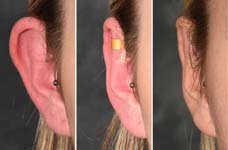 There is a slight bulge over the cartilage which shows the position of the clip.